PSZH APC Driving | CWP. Warm up with our smallest amphibious APC The D-442 FÚG "amphibious reconnaissance vehicle") is a Hungarian armored scout car based on the Soviet BRDM-1 armored scout car. The all-welded steel armor hull of the PSZH-IV provides the occupants with protection from small arms fire and shell splinters. The commander and driver are seated at the front of the vehicle. Both have a hatch cover in front of them hinged at the top and opening forwards, and a windscreen with a wiper blade. The hatch cover is equipped with an integral vision block for observation when the hatch is closed. A door, four vision blocks and two firing ports are provided in each side of the hull. The ports are positioned on either side of the hull door, next to a vision block. The six infantrymen are seated around the sides and rear of the fighting compartment in what must be very cramped positions. The side door is in two parts, top and bottom, with both parts opening towards the front of the vehicle. 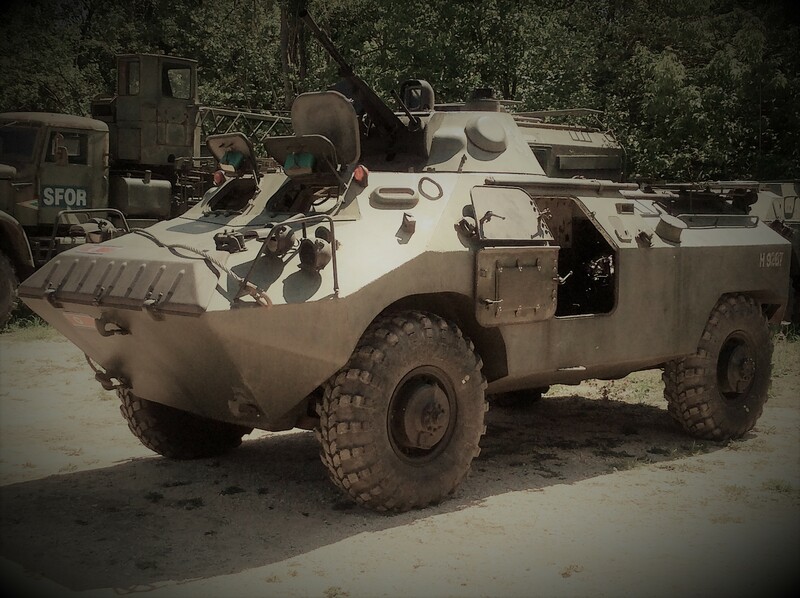 The turret is in the center of the vehicle and is a different shape from that of the Russian BRDM-2 (4 A— 4) amphibious scout car, with a stepped top and forward-facing day periscopes in the top part. Like the turret fitted to the BRDM-2, it has no roof hatch. The sight for aiming the armament is in the roof of the turret, just in front of the periscope. A ventilator fan is provided on the left side of the turret. The water-cooled diesel engine is behind the turret and is much more powerful than that installed in the earlier FUG. The PSZH-IV is fully amphibious and propelled in the water by two water-jets at the rear of the hull. Before entering the water a trim board, which is stowed folded on the glacis plate when not in use, is erected at the front of the hull. Standard equipment includes infra-red driving lights, an NBC system, a power-operated winch and a central tire-pressure system that allows the driver to adjust the tire pressure to suit the type of ground being crossed.